Things are getting Despicable at Universal Studios Hollywood, as the all new Despicable Me:Minion Mayhem continues technical rehearsals. The park is also testing out the all new ride for the new Super Silly Fun Land, as it prepares for the huge grand opening. Guests on the Studio Tour found out that they still need a bigger boat, and construction increases on The Wizarding World of Harry Potter…plus a lot more. Super Silly Fun Land at Universal Studios Hollywood will take the world of Despicable Me and bring it to life in an all new way. The area will be an all new water play ground, that will also feature a huge dry portion. The area will be for guests of all ages, but will geared more towards the Minion sized guests. The area is currently under construction, but we were able to get a peek at the different phases going on. If you are a huge fan of the little, yellow, friends of Gru then you’ll be happy to know that Minions are everywhere! They are in every facet of the area, with tons of the guys making funny appearances all over Super Silly Fun Land. You can expect to see Minions roasting bananas, eating bananas, playing with the signs, and chasing bananas. Did we mention they like bananas? The area is still under tons of construction, but at this point it jsut seems that some final details are still being worked on. There are still some large areas that are a good ways off from being finished, but for the most part the area looks almost ready. One huge aspect of the new land is the Silly Swirly. The ride is a simple spinning flat ride that features silly bug creatures going in circles and flying up and down over Super Silly Fun Land. The ride will be very similar to Kodos and Kang’s Twirl n Hurl at Universal Studios Florida. Already employees of Super Silly Fun Land are out and having fun with guests. Guests can also already visit with Gru, the Girls and of course Minions. The ride-Despicable Me:Minion Mayhem, is currently in soft openings, and guests can already experience the neighborhood area, as well as grabbing a bite at Gru’s Lab Cafe. While Mayhem is happening at the hands of the Minions, guests on the Studio tour remembered one thing….they’re going to need a bigger boat. The JAWS portion of the Studio tour has finally reopened after being closed for the past few months. The shark is back, and better than ever as he attacks and devours those poor innocent villagers. 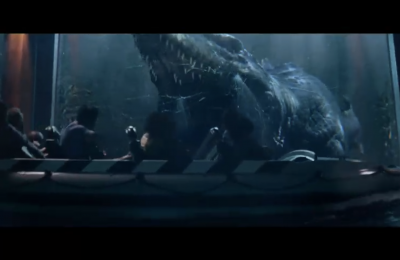 The iconic terror of the deep is back to making his normal runs on the tram, and devouring anyone who happens into the lake. The Simpsons area recently opened the all new Carnival style games outside of the Simpson’s Ride. From what rumors suggest it is just the beginning of the Simpson’s Fun that guests will see at Universal Studios Hollywood. According to many rumors, Springfield will be coming to the park as early as next year, with a bevy of new fast food restaurants. The new area will be very similar to what just opened this year at Universal Studios Florida, but will be a little bigger and feature a different landscape to it than the Florida version. You can expect to get silly and sloppy with Krusty Burgers, and even have a Flaming Moe. 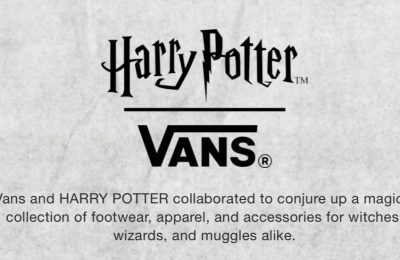 Meanwhile, The Wizarding World is continuing to rise from the dirt. 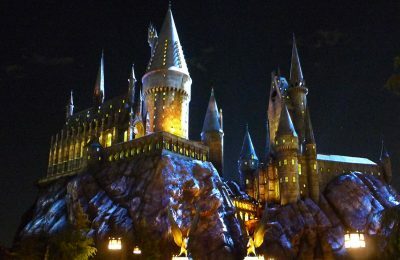 Hogsmeade will feature several of the same elements that are currently available at Islands of Adventure in Florida, including Harry Potter and the Forbidden Journey. This version is rumored to be similar, but instead of just being able to tour the castle, and ride along with Harry Potter, rumors strongly suggest that guests will be able to eat in the Great Hall as well, with an all new dining experience. Offsite, what we can only guess is a new parking structure seems to be gaining steam. This new parking structure will help add infrastructure to the hordes of crowds expected to descend upon USH in the near future. Slideshow-Check out even more pictures from around Universal Studios Hollywood, including more minions and construction! Stay tuned as we bring you even more from Universal Studios Hollywood as the Minions are unleashed next month! Be sure to follow along with us on Twitter @BehindThrills for the latest updates!